How is it possible to come to agreements without losing our time and energy in a lengthy process full of tensions? And how can we ensure that the agreed upon decisions are clear and binding to every actor involved? When we look at the obstacles to a smooth and effective collaboration in a team and community it becomes evident, that it is crucial to share an alignment in how to take clear and binding decisions together. Sociocracy 3.0 (S3) offers a pattern on decision making that allows each participant to contribute to the proposal in a clearly guided process. The S3 decision making process is applied in a situation where the team and community faces a proposal to resolve a tension. A tension can be any kind of situation that requires a common agreement to be resolved in a clear manner. The facilitator asks the person holding the proposal to present it to the participants in a short and concise manner. Depending on the complexity of the proposal it can be helpful to use charts to make the information more digestible or in case of a minor proposal just to present it orally. The facilitator asks the participants if there are any clarifying questions regarding the proposal. At this point no objections or suggestions on how to improve the proposal are voiced, but only specific questions are asked to understand the details of the proposal. The proposal presenter can answer the question posed by the participants, while the facilitator guides the question round. Once all the clarifying questions have been addressed the facilitator asks whether this proposal as it stands is good and safe enough to try or whether there are any objections. The participants then can choose one of three hand signs to voice their opinion: Thumbs up means “I agree on the proposal”, a shaking hand means “I agree on the proposal but would like to voice a concern” and a hand with the palm facing up means “I object to the proposal and have an idea to improve the proposal”. 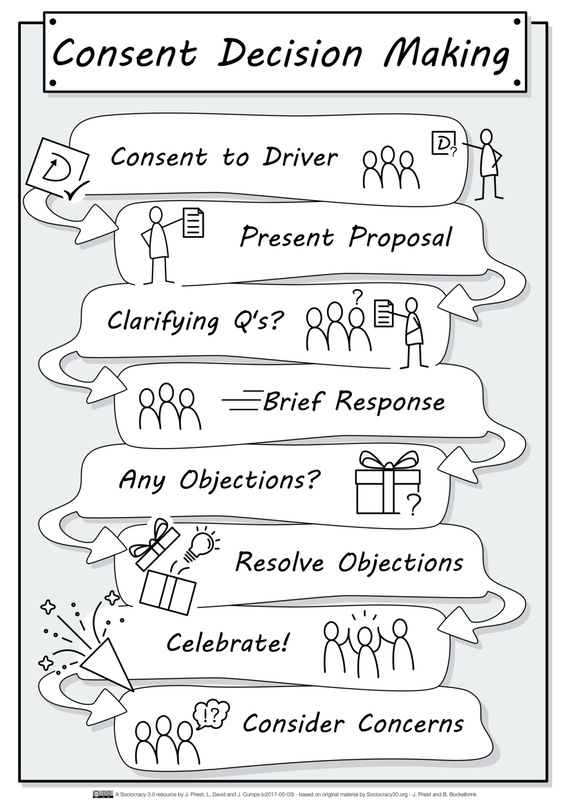 When no objections are voiced by any participant, a decision has been reached and the facilitator asks the participants with a concern to express it. The concerns are documented by the note keeper in the logbook where the agreement is kept. In case an objection is voiced the facilitator initiates another round to ask if any participant has an objection to the objection. In case there are objections to the objection the facilitator seeks to mediate in order to find a solution that includes all points of view. Once the participants have agreed on the objection to be relevant, the facilitator asks the person with the objection to suggest an amendment to improve the proposal. If the person with the objection does not have an immediate improvement the amendment suggestions can be opened to the rest of the participants. The facilitator guides the discussion to reach a new proposal that the participants then can vote on again with the three signs: Thumbs up, shaking hand and a hand with a palm up. In case another objection is voiced the process is repeated until an agreement can be reached. -There can be up to 20 people participating in a decision making round, although smaller circles up until 10 are preferred to ensure an artful participation of everyone. -Each decision making round should be time-boxed in agreement with the whole team, while the facilitator keeps the time and steers the process accordingly. The S3 decision making process.